The natural maxillary central incisors of a sample of 302 individuals (n = 119 male, n = 183 female) were measured [Figure 1]. For the purposes of the study, the patients were divided into three age subgroups [young, ≤35 years (n = 177) –59%; middle-aged, 35–54 years (n = 102) –34%; old, ≥55 years, (n = 23) –7%], three educational background subgroups [college (n = 143) –47%; high school (n = 83) – 28%; primary school (n = 76) –25%]. 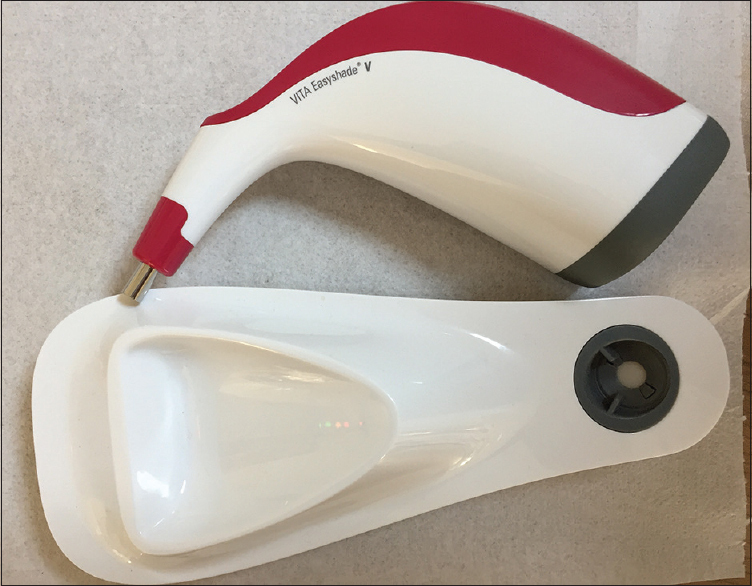 Color measurements were carried out by an experienced clinician using a Vita Easyshade spectrophotometer (Vita Easyshade V; Vita Zahnfabrik) [Figure 2] according to the manufacturer's instructions. This digital shade-matching device, which uses D-65 illumination for color selection, was subjected to a verification test to assess its reproducibility and reliability. 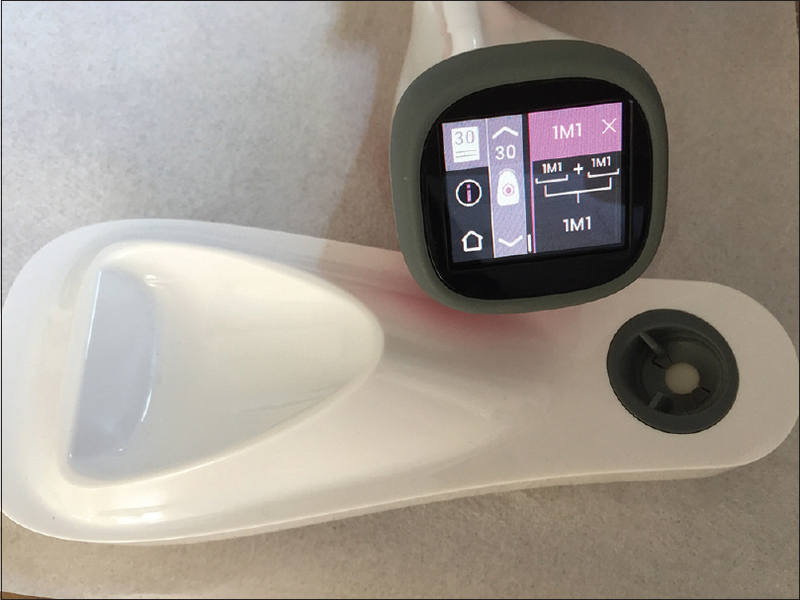 In accordance with the manufacturer's instructions, an infection control shield was placed on the probe tip and calibrated before each measurement. 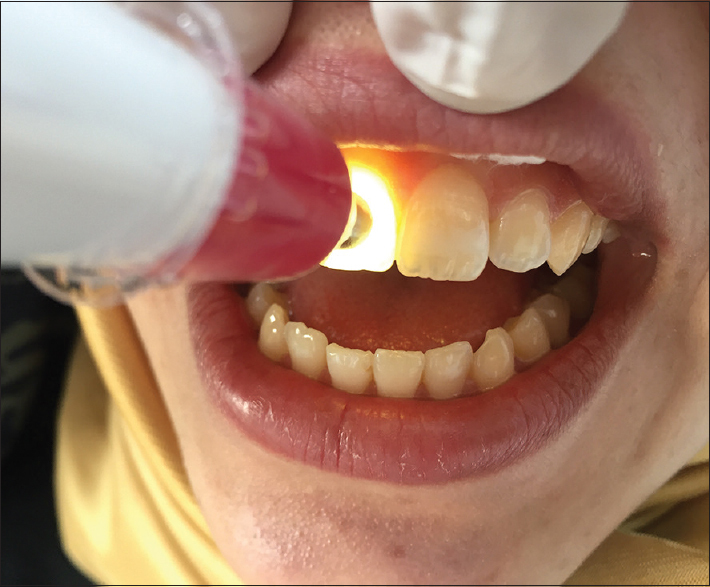 To ensure standardization of the procedure, the probe was placed in the middle third of the labial tooth surface [Figure 3] and all measurements were performed under artificial light conditions in the same dental clinic. The L*, a*, and b* variables were recorded [Figure 4]. 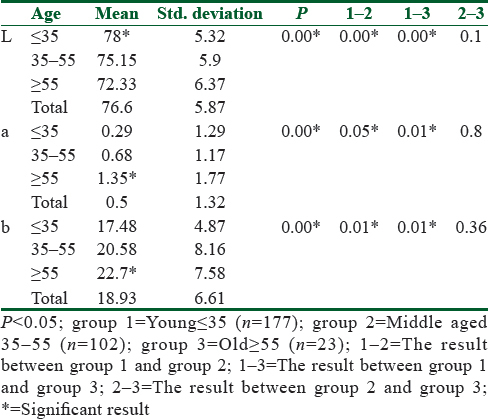 [Table 1] shows a significant difference between all three of the L*, a*, and b* parameters among different age groups. According to the Scheffe's test conducted to determine which groups differed from each other, all three of the L*, a*, and b* parameters showed a significant difference between the young and middle-aged groups and between the young and old groups, but there was no significant difference between the middle-aged and old groups. [Table 2] shows that a significant difference was found for the a* and b* values and more differences were found in males than females. 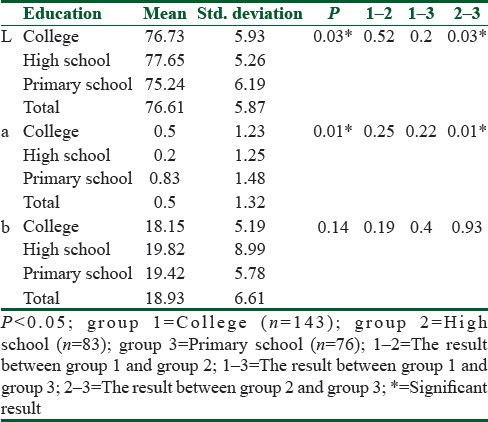 In this study, although there was a significant difference between the L* and a* parameters of the patients with different education levels, no significant difference was found in the b* parameter, as seen in [Table 3]. Kiyak HA. Does orthodontic treatment affect patients quality of life? J Dent Educ 2008;72:886-94. Pithon MM, Nascimento CC, Barbosa GC, Coqueiro RD. Do dental aesthetics have any influence on finding a job? Am J Orthod Dentofacial Orthop 2014;146:423-9. Vallittu PK, Vallittu ASJ, Lassila VP. Dental aesthetics - A survey of attitudes in different groups of patients. J Dent 1996;24:335-8. Joiner A. Tooth colour: A review of the literature. J Dent 2004;32:3-12. McLaren K. Colour space, colour scales and colour difference. In: McDonald R, editor. Colour Physics for Industry. Huddersfield: H. Charlesworth & Co Ltd; 1987. p. 97-115. Bridgeman I. The nature of light and its interaction with matter. In: McDonald R, editor. Colour physics for industry. Huddersfield: H. Charlesworth & Co Ltd; 1987. p. 1-34. Watts A, Addy M. Tooth discolouration and staining: A review of the literature. Br Dental J 2001;190:309-16. Muia PJ. The Four Dimensional Tooth Color System. Chicago: Quintessence Publishing Co., Inc.; 1985. Joiner A, Jones NM, Raven SJ. Investigation of factors influencing stain formation utilizing an in situ model. Adv Dent Res 1995;9:471-6. Goodkind RJ, Schwabacher WB. 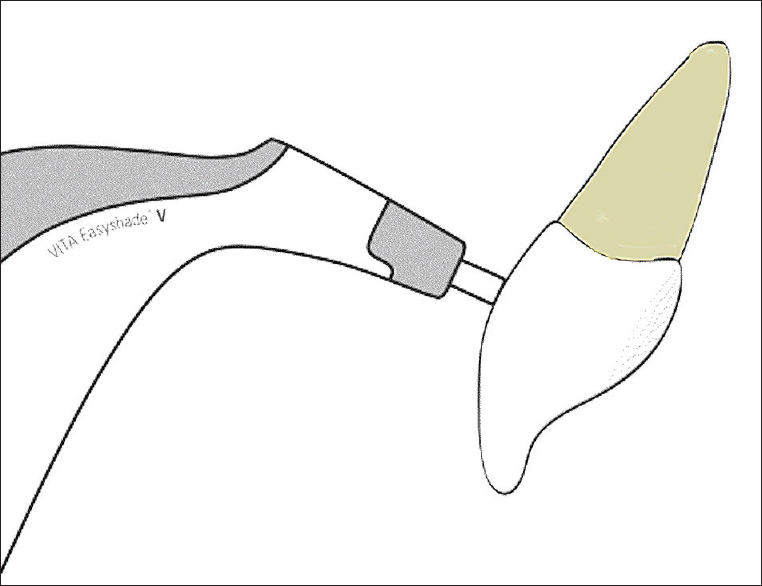 Use of a fiber-optic colorimeter for in vivo color measurements of 2830 anterior teeth. J Prosthet Dent 1987;58:535-42. Esan TA, Olusile AO, Akeredolu PA. Factors influencing tooth shade selection for completely edentulous patients. J Contemp Dent Pract 2006;7:80-7. CIE (Commission Internationale de l'Eclairage): Improvement to industrial color-difference evaluation. 2001 CIE Technical Report, Publication 142. (CIE Central Bureau: Vienna). O'Brien WJ, Hemmendinger H, Boenke KM, Linger JB, Groh CL. Color distribution of three regions of extracted human teeth. Dent Mater 1997;13:179-85. Vaidya S, Ahuja N, Bajaj P, Kapoor C, Sabarwal R, Rajpal K. Objective measurement of shade color in age estimation. J Forensic Dent Sci 2015;7:171-4. Gómez Polo C, Gómez Polo M, Montero J, Martínez Vazquez De Parga JA, Celemin Viñuela A. Correlation of natural tooth colour with aging in the Spanish population. Int Dent J 2015;65:227-34. Gozalo-Diaz D, Johnston WM, Wee AG. Estimating the color of maxillary central incisors based on age and gender. J Prosthet Dent 2008;100:93-8. Hasegawa A, Motonomi A, Ikeda I, Kawaguchi S. Color of natural tooth crown in Japanese people. Color Res Appl 2000;25:43-8. Veeraganta SK, Savadi RC, Baroudi K, Nassani MZ. Differences in tooth shade value according to age, gender and skin color: A pilot study. J Indian Prosthodont Soc 2015;15:138-41. Choi JH, Park JM, Ahn SG. Comparative study of visual and instrumental analyses of shade selection. J Wuhan Univ Technol Mat Sci 2010;25:62-7. Paul S, Peter A, Pietroban N, Hammerle CHF. Visual and spectrophotometric shade analysis of human teeth. J Dent Res 2002;81:578-82.